Time is relative. Time can be manipulated. 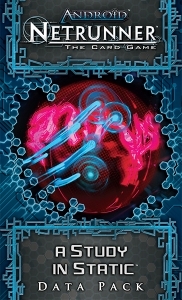 The fourth Data Pack in the "Genesis Cycle" for Android: Netrunner, A Study in Static focuses on developing each faction's traditional strengths even as it opens up new strategies for players to explore; each of the four Corporations receives a new piece of ice, and all three Runners receive a new icebreaker. 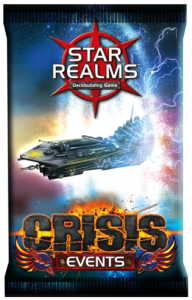 New resources and agendas permit players to pursue tightly focused deck builds centered around an increasing number of tricks and traps. Meanwhile, A Study in Static also allows players to reevaluate their existing decks and reconfigure them for greater efficiency. 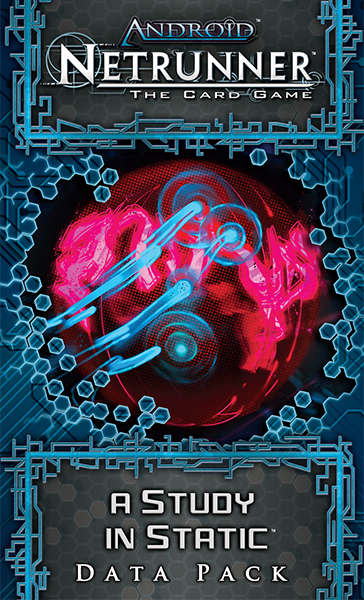 With their advancements in ice, icebreakers, and hardware, the sixty new cards from A Study in Static (three copies each of twenty individual cards) escalate the game's cyberstruggles to a new form of art. No longer do the factions content themselves to building and breaking snares and subroutines; they turn their attentions to the flow of time itself. So much as time is a matter of perception and of movement, A Study in Static is a study in the ability to accelerate and impede the passage of time. 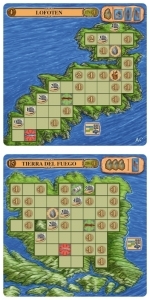 Push even farther into the unknown with Lofoten, Orkney, and Tierra del Fuego, the first mini-expansion for the critically acclaimed A Feast for Odin! With two new exploration boards that take you to far-flung locales, you can unlock more options than ever before. Send your Vikings to the archipelago of Lofoten, the Orkney Islands, or as far south as Tierra del Fuego and discover the possibilities that await you there. Each of these boards gives you the opportunity to score more points, generate additional income, and obtain new bonuses if you can fill them with the goods you have plundered. These lands offer a bountiful treasure to anyone brave enough to discover them. Boldly set sail and continue your saga! 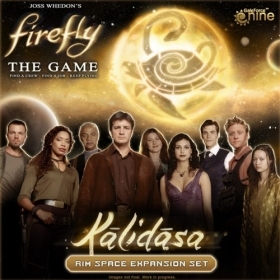 The second Rim Space Expansion set for Firefly: The Game, Kalidasa adds a massive star system to the 'Verse with loads of new opportunities for adventure and profit. No sector of space is safe as the long arm of the Alliance reaches out beyond the central planets with the addition of the Operative's Corvette. Every region of the 'Verse becomes more dangerous with the addition of new Nav Cards for Alliance Space, Border Space and Rim Space.